Puppies and kittens both inherit a natural immunity from their mother that protects them from birth. This natural immunity continues until about 6 weeks of age. After 6 weeks, your pet depends on you to continue that protection until their own immune system is fully developed. Your pet’s immunity isn’t fully developed for 12 months. 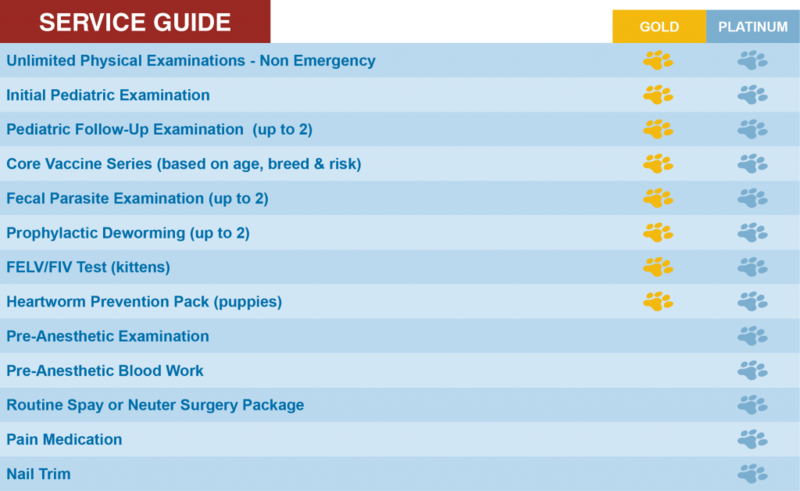 A Preventative Care Plan is designed to continue that protection by providing all services necessary to carry your young pet through the important first year of life. You’ll have a healthier, happier kitten or puppy as a result of preventative, Petly health care plans. Your pets also stand a better chance of living longer. Our plans include all necessary examinations, vaccines, lab work, and you’ll get other tests needed during the first year. If your pet has not been spayed or neutered, pre-surgical blood work, hospitalization for the day, surgical procedure, and a re-check are included. See our Information Book below to see how care progresses from your first visit progresses. Pets must be healthy to enroll. If your pet is in heat, pregnant, or diagnosed as cryptochrid at time of surgery, additional charges will apply. Must provide voided check, major credit or debit card and a photo ID to sign up. Here’s our Information Book where you can learn more.